Our chamber can sit up to seven people at any one time and whilst our MS members get priority, we welcome people with other conditions when space is available. We subscribe to advice from the Hyperbaric Oxygen Treatment Trust (HBOTT) about oxygen treatment and, before starting your treatment, we will check for any recommendations for your condition. Please be aware we are unable to treat anyone under 18. 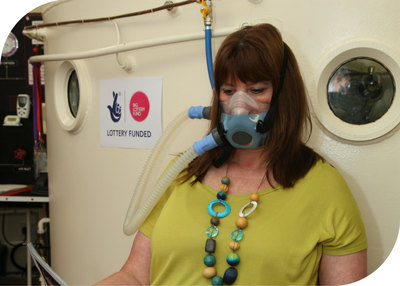 Please see the MS National Therapy Centres (MSNTC) website for a list of other Centres who offer oxygen treatment. We are all independent charities and we cannot advise on their policies, pricing or availability. Please contact them direct. As our priority is our MS members, on occasion we may need to rearrange your sessions. For more details about receiving oxygen please fill in the details below so we can seek professional advice about your oxygen treatment. Please note: There is a £30 charge for people with other conditions. We ask for a £25 refundable deposit to borrow a mask or you can purchase a mask for £75.